Have you ever wondered how Megan Chakrabarti, Jacob Goldstein, or Ira Glass develop the stories that they tell on National Public Radio? Do they step up to the microphone and just start talking or have they taken the time to write and rehearse what they will say? Using audio resources available at Yale…we will learn basic techniques for audio production: recording, cutting audio, sound design. Students will be expected to select a topic for the final project by the second week and begin reporting and collecting ‘tape’ … by the third week. 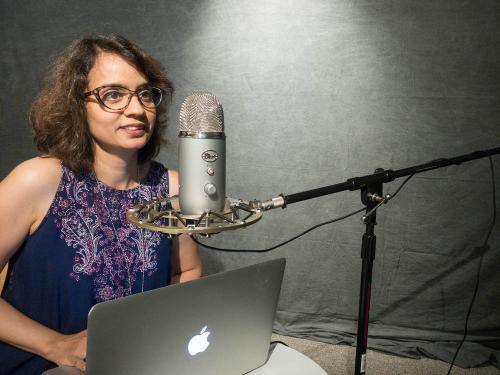 The course was a study of the radio/podcast medium and a collaborative endeavor for students as they worked with Oppenheimer and staff from the CTL to produce a series of podcasts about undergraduate life at Yale. Students visited the CTL Studio Suite to record and cut audio after editing their scripts. In total, 15 students used the resources in rooms 116E and 118A for an approximate total of 75 hours.